It’s Dragon Con, time to geek out and cosplay. Check. But Stormtroopers in Sailor Moon outfits? The Alabama Garrison of the 501st pulled it off brilliantly. Jeremy Athy (Sailor Scout Mustafar, red), Josh Harris (Kamino, blue), Christi Boston (Artemis, white cat), Christian Gilliam (Luna, black cat), Derrik Bomagat (Tatooine, orange), and Robo Hutchins (Endor, green) dual-rocked their fandom on Friday afternoon. But…um…WHY? One of the group suggested the idea, and you know how storm troopers can be. These are the outfits you’ve been looking for. Once the suggestion was implanted, what could they do? They had to make it happen. 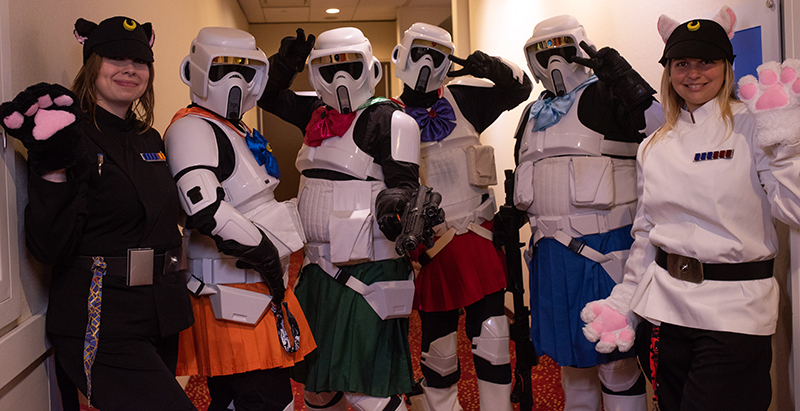 So Sailor Moon Scout Troopers stormed the Marriott on Friday afternoon, and everyone loved it. Although these intrepid stormtroopers have marched in the parade, they decided to skip it this year. A wise decision, perhaps. Their appearance would certainly have sent smiles blasting through the crowds, but their outfits were definitely not regulation. Darth Vader would not have been pleased. And Stormtroopers are as disposable as red shirts. 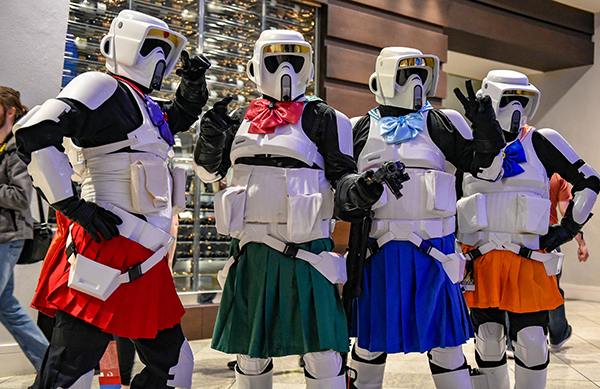 But…stormtroopers in Sailor Moon skirts? *giggle* Maybe even Vader would have cracked a smile. Way to go, Alabama Garrison!